From the Daily Beast today, we learn that the Ground Zero mosque developers, who still owe more than $200,000 in back taxes, have jumped the funding shark. Evidently, those Saudi millions have failed to come through as planned and the mosque developers have applied for a federal grant to get their “cultural bridge” out of the water. The mosque developers, having at last report only about $20,000 in their bank account, have applied for — stop the presses — five million taxpayer dollars. 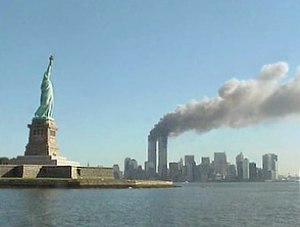 The grant money, if approved, will come from a special fund set aside for rebuilding the area around the Islamist attacks on the World Trade Center on September 11, 2001. And, of course, there are no restrictions on religious organizations applying for the taxpayer funding. The only requirement imposed by federal bureaucrats is that the structure, when complete, have some space allocated for non-religious purposes. The Ground Zero mosque plans include a “community center” along with their Muslim prayer rooms. Unless this administration has gone off the deep end this project appears to be dead and that is a good thing for the US and for Muslims in this country who respect the sensitivity of the victims of a mass murder for Allah attack.